Instant Keno (Betsoft) - Casino Answers! 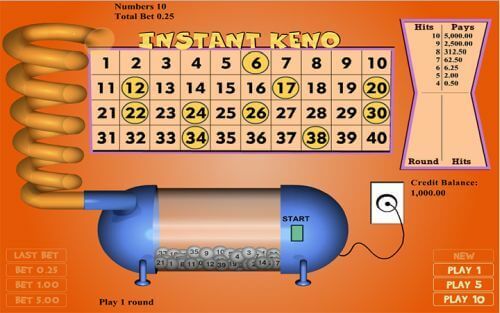 Instant Keno, a lottery ticket-themed online game developed by Betsoft Gaming, is among the many versions of Keno wherein other variants include Caveman Keno and Cleopatra Keno. The noun Keno’, which was Americanized in the early 1800s, was borrowed from either the French word quine’, or Latin words quini’ and quinque’. The former word refers to five, especially winning combinations. The latter words, which are nowadays notably used as a prefix (quin-), refer to denominations of five. Cheung Leung, who was a ruler during the Han Empire, is credited with inventing an older version of the game in his quest for financing military campaigns, and the game allegedly aided in fundraising for the Great Wall. Chinese jobseekers, especially those prospecting for the Pacific Railroad jobs, exported it to America. Instant Keno was once called Racehorse Keno in order to circumvent the then anti-lottery laws. Most present-day Keno versions, especially Instant Keno, have balls numbered from 1 up to 80, although the earliest version had 120. First, Instant Keno players place bets. Secondly, players are required to pick their preferred ball numbers, which should be between three and ten, from a total of 80 balls. Third, 20 balls are drawn randomly after passing through a mixer. The pay is determined by the ‘Called Numbers’ vis-à-vis the players’ chosen ball numbers (called hits’), and the amount staked. The betting range varies from one developer to another. For instance, Betsoft’s version of Instant Keno has a $0.02— $1.00 bet range whereas a particular Michigan-centric casino operator has a lottery program capable of supporting up to $20. Instant Keno has a therapeutic layout and simple navigation panel. For instance, the centered virtual keno board is divided into two parts, whereby each part consists of 40 ball numbers. Accordingly, the playing process is obvious and appealing as it enables zooming out/in. This game is hailed as among the easiest and fair game. What’s more, players can sit back and simply look on because an automated process can help them select ball numbers at random. Players can track the rounds played and the hits scored. An impressive thing about Instant Keno is that players can win huge payouts based on small stakes. For example, if a player bets $0.25 and gets 10 hits, the payout is $2,500.00. The topmost payout can be as much as $50,000 for a $5.00 worth 0f card with 10 hits. On the flip side, Keno variants are associated with a house edge which can spell doom to a player. Moreover, all video keno games have a relative speedier play rate, meaning stakes go at a higher rate. Winning Instant Keno is not dependent on the type of numbers chosen. This is because all ball numbers have 1/80 probability of appearing in the ‘Called Number’ section in a particular game. However, popular opinion advises players to know the amount of numbers to select. Luck plays a considerable role when winning a game of Instant Keno. New players should practice playing Instant Keno, especially using Free Chips, before staking. Most surveys on the return to player rate associated with Keno variants, including Instant Keno, show rates that hover between 65% and 80%. The house edge for these Keno variants is between 20% and 35%. Is there other versions of instant keno? Yes there is a game entitled Instant Keno 80 Ball.